Just a few of the success stories from people who have attended PHPT classes. I have found that Conquer Gravity is a mind and body discipline. There’s an emphasis on maintaining form in the execution of each movement which demands total mental and physical concentration. I have definitely experienced benefits; mainly being increased power and balance. “Sabrina I would like to tell you that your Pilates class is working – I just bent down (without putting my hands on thighs to help me) for the first time in months! Thanks. I’m definitely a satisfied customer”. “Before starting the class I had just given birth and was feeling flabby and like I needed motivation to get back into exercise and regain my ‘old self’ again. I had done Pilates before and I knew the real benefits it could bring to core strength and toning. I was really grateful to find a class that could allow me to exercise with my baby. The classes (at Tribe Porty) have being Fantastic, it’s a really friendly and supportive atmosphere and it has been really great getting back into exercise with new Mums. Sabrina is a brilliant instructor, she has a great balance of supporting you and challenging you and I look forward to the class each week – even if I do ache the day after, I feel like I have really worked out. I feel stronger and more toned than ever before. The class has really helped me to strengthen my stomach muscles that had split during my pregnancy and I am now looking to join the adults only class to continue Fitness Pilates on my return to work. “Life was Hectic just before I started Mother and Baby Pilates! I Feel that the class along with having a good support network has allowed me to (almost!) get back to my pre baby self, not just physically be mentally. Taking baby along, however its been much easier than I’d imagined and thankfully Sabrina, you have been a star jiggling the babies around if needed. The Classes with Sabrina have been fun and relaxed but tough enough to give you a bit of an ache without any pain. I can now do a plank which I couldn’t even do before having a baby. Feel more in control of pelvic floor. “Sabrina cured the awful saddle pain I was experiencing. I had replaced my saddles but that hadn’t helped and on one ride the discomfort forced me to stop. My riding buddy suggested I do some stretches he had learned at Pilates and they helped me finish the ride. I went to one of Sabrina’s sessions and explained the issue. She guided me through some stretches and I felt an immediate improvement. We also worked on my core muscle strength and posture. The saddle pain has now completely gone and I have better posture and less neck and shoulder discomfort. It’s amazing that so many of the aches I put up with over the years could be so easily alleviated with these weekly exercises”. I started coming to mother and baby Pilates when my son was almost 10 weeks old. It was a bit of a nightmare at the start to make it out the house and to the class for 11 o’clock but we soon got used to it. I had kept pretty active throughout my pregnancy but Pilates was the first thing i’d done since giving birth. It was great to get moving and feel like my body was my own again. I’d done antenatal Pilates with another instructor. This class was quite tame so I was worried that Sabrina’s class would be the same and a bit of a waste of time. I was pleasantly surprised as even from the first week we were challenged to work our core and pelvic floor. I really felt like i’d had a work out by the end of the class. Throughout the 6 week block of classes we’ve done a variety of different exercises each week. Although most weeks we do have to do the dreaded plank which really challenges our core, we have used a variety of equipment including balls and bands. I think the difference with this class than other mother and baby classes is that Sabrina is so helpful with the babies. It’s obvious she really enjoys having them there and does not find them to be an inconvenience. On many occasions she can be seen with 2 or 3 babies on her mat calming them down while their mums get to carry on with the class. I think all the mums really appreciate this as it takes some of the stress away when your baby is unsettled. I really do feel the Pilates class has been a great start back into getting my pre-pregnancy body / fitness back. It gave me the confidence to start back with my fitness classes and running. I also think the social side of the class has been very important to me being a first time mum. It’s just nice to know that there are other mums who are going through the same things as you. 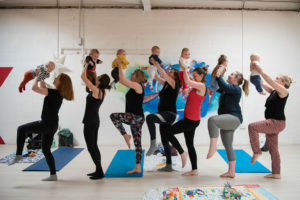 I would definitely recommend Sabrina’s classes to other mums, and even if you don’t feel like doing a whole load of different classes with your baby, I would say you should definitely give this Pilates class a go, not just enjoyable for mums but I think the babies have fun to! A.A. 35, Mum to Alex (7 month old). I really look forward to my Monday Pilates session (at Tribe Porty) – it has really helped me regain a lot of the core strength I lost during pregnancy and improve my posture. I wish I could do it more than once a week! Sabrina is an excellent teacher, she explains the positions clearly and patiently and how to breath – which is the bit I always forget! She also gives you a baby version each time – useful of your little one is playing up! Before starting the class I was worried whether I would actually feel like I was doing exercise – I am more of a runner than gentle stretcher, however I have been completely proven wrong – I feel my muscles really working hard and it really makes you feel good on a Monday morning! Finally, I love that it is so relaxed bringing the little ones! Rory loves rolling around and looking at the other babies and I love I can just leave him to it for an hour! Pelvic floor, what pelvic floor?! I had little or no control over my pelvic floor since the birth of my daughter. Sabrina had me pulsing it back into shape within a few weeks. I also benefitted massively from lots of stretching and now when I miss a week I can really feel the difference. Definitely a good release of tensed shoulder and back muscles. My daughter is rather vocal and demands a lot of attention. I was worried she would be the only baby crying during the class and a distraction to other mummies. However, I had nothing to worry about. All the babies take their turns in crying and Sabrina is always willing to distract a crying or vocal baby by picking them up and comforting them for a few minutes while we work those abdominals. I’ve really enjoyed and benefitted from them. It has been a nice class to do and I’ve enjoyed meeting the other mummies and babies. I wasn’t expecting to work quite so hard and afterwards I ache in places that haven’t ached for a very long time. The atmosphere is relaxed, but the pace is good and I enjoy this as I like to know that I’ve worked out. Getting control of my pelvic floor back was one of the results from attending the classes! I also feel that it’s made a difference to my waistline. Thanks Sabrina! Life was busy with a new baby, new life and new body to deal with everything is a bit topsy turvey. I’m not fit and wondered if I would be able to manage it. It had been a long time since I had done any exercise at all. Couldn’t imagine how I could exercise with the baby there. The classes have been great! You have been such a patient teacher. Building up the complexity at just the right pace to match our slowly recovering bodies. I genuinely can feel the difference it has made to my body, but never felt out of my depth or like too much was expected of me. It has also been a very relaxed and fun atmosphere, which is mainly down to you, meaning there was no need to feel embarrassed either by our own inabilities or screaming babies. Also having you relieve us of the wee ones so we can concentrate on the more difficult manoeuvres was so helpful. Other than meeting lots of lovely girls and having a laugh, I feel so much stronger. I am sure I have a six pack for the first time in my life (hidden under a bit of flab but I’m working on that!) and my lower back is much stronger too. I have suffered with problems for years but it feels much more supported now. Another wonderful benefit was beating my brother-in-law at a plank-off! He is super fit and goes to the gym every day, but I out-planked him on a new years dare….3 mins 30 seconds…very proud of myself.